Combine the garlic, lemon juice, lemon zest and a pinch of salt in a small bowl. Let sit for at least 10 minutes and up to 2 hours. Combine the remaining melted butter with the herbs, capers, anchovy and bread crumbs in a medium bowl. Mix well, ensuring that all the bread crumbs are well coated with the butter and herb mixture. Set aside until ready to serve. Grill the eggplant: Prepare a medium-high fire on your gas or charcoal grill. Brush both sides of the eggplant slices with butter and season with salt. Grill (covered on a gas grill; uncovered on a charcoal grill) over indirect heat until golden-brown grill marks form, 3 to 4 minutes. Turn the eggplant and grill until tender and well-marked on the second sides, 3 to 4 minutes more. Just before serving, combine the lemon garlic mixture with the herbed bread crumb mixture. Season to taste with additional salt and/or lemon juice. 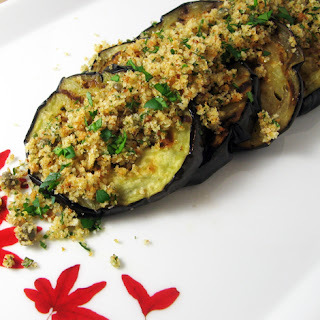 Spoon the seasoned bread crumbs atop the grilled eggplant slices or serve alongside. Can be served warm or at room temperature. 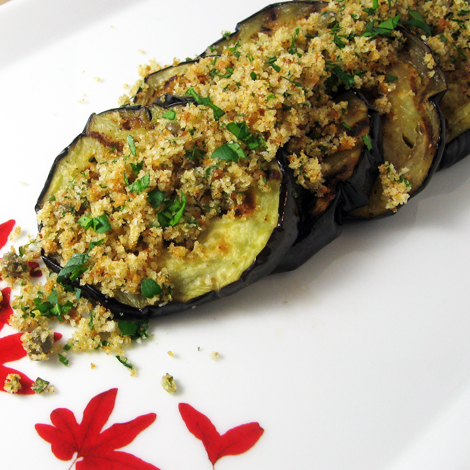 For a lovely summer salad, layer eggplant with thin slices of fresh mozzarella and tomato and spoon bread crumbs on top.